As of now (about noon California time) the iPhone 2.0 software update hasn’t officially launched yet, but everyone who cares knows that for the last five hours they could download v.2.0 anyway and access the App Store. Early download stats are coming in on the most popular apps. We’ve divided these into two lists, one for paid apps and one for free apps (there’s a big difference in download numbers). We’ll update for comparison purposes in 24 hours or so. We’ve listed some of our personal favorites here. And the sleeper hit is clearly PhoneSaber, which I deftly demo here and here. 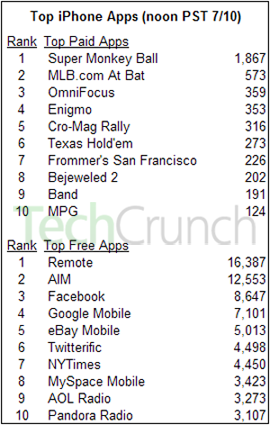 With just 2,229 downloads, though, it doesn’t make the top ten list for free apps. In early download voting, Facebook is beating MySpace hands down with nearly 3x as many downloads. One thing Facebook has that MySpace doesn’t – the chat feature is enabled, which is a really nice feature.